This news story about the 13th Zodiac Sign Ophiuchus is the biggest attention astrology has had recently. This story has been in the news before, but this time it was spread like wildfire because of the internet. It has put the spotlight on common Sun Signs and how they relate to the constellations of stars. Melissa Bell at The Washington Post has quoted me in her article in the Washington Post titled New Zodiac sign dates: Don’t switch horoscopes yet: “It is the planets moving across the backdrop of the stars which influence our lives, not the planets moving through imagined 30 degree divisions on a piece of paper.” This is from an article I wrote last year called Precession of the Equinoxes. I don’t use astrological signs at Astrology King but I do use the tropical zodiac we are all familiar with. I use it as it was intended, as a mathematical tool to draw up the horoscope. Instead of using the Sun signs for interpretation, I look to the aspects the planets make, and to the fixed stars. It is possible to understand astrology without using any Sun signs, in fact things become much clearer when you take the signs away, and all the baggage that has built up around the signs, such as elements, ruler-ships etc. Astronomers and critics have a good point when they rubbish astrology, citing the constellations and precession. Their argument is logical. I was a scientist, and I am very critical. I’m also an astrologer, and like the great astronomer/astrologer Johannes Kepler, I see the value of the tropical zodiac as a measuring tool, but not the value of Sun signs. There is a growing mass consciousness awareness of this issue. Astrology has a critical role to play in the shift in consciousness beginning to occur. We are evolving away from the zodiac sign astrology and the strict rules and regulations that are based on the 30 degree divisions. So this big news story about the validity of astrology has the world abuzz with questions about the Sun signs. Now many people are questioning astrology and looking a bit deeper. Astrologers are being forced to defend their art, and they themselves have to look deeper. This is just the beginning of the process. The Jupiter Uranus conjunction last week has brought this new awareness about astrology. Uranus square Pluto from 2012 to 2015 may well bring fundamental changes to astrology, a major transformation. Ophiuchus constellation spans all of Sun sign Sagittarius. As an example of how Ophiuchus affects us more than Sagittarius, check out the horoscope of Tiger Woods. He has Moon in the sign Sagittarius, but it is on the brightest star in Ophiuchus called Ras Alhague, the Head of the Serpent-charmer. This star with the Moon gives “misfortune through women, perverted tastes and mental depravity”. 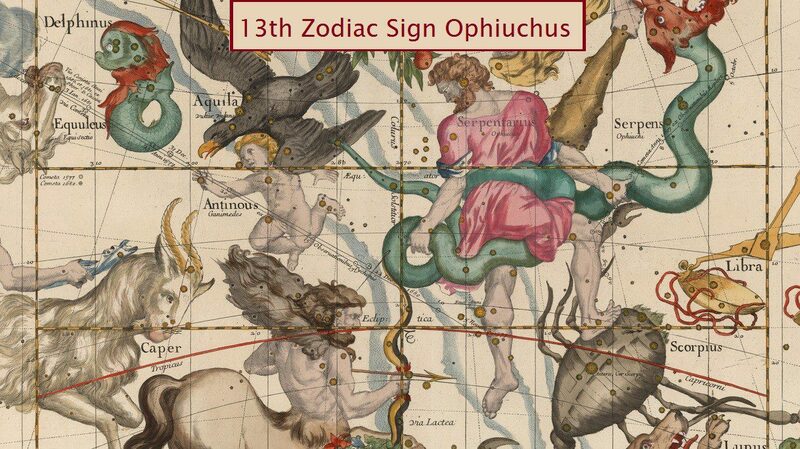 The 13th Zodiac Sign Ophiuchus will appear in the mainstream news again in the future. Scientists and skeptics like the smug BBC astronomer physicist Brian Cox, continually attack astrology based on the difference between the constellation and the Signs bearing their name. Brian seem to have an intense passion to destroy astrology. There will be many more lining up with the intent of destroying astrology, including religiously motivated politicians. Laws may be enacted to outlaw the practice of astrology on the internet or elsewhere. The challenge for astrologers is to accept this fundamental flaw in astrology and take steps to rectify it. Otherwise, the days of astrology are numbered. You might want to edit your homepage. “After all these years, the planets positions are not what they used to be”. The planets positions are not the same as they were yesterday either. It is the position of the stars and their constellations which have changed in relation to the tropical zodiac. That’s what you call a stellium! CAtherine Tennant’s book on lost constellations puts this birthdate within Hydra which feels like the Leo but Pisces ruled 12th house the stellium fall in. I can relate to Hydra a lot. I spent four years in JUngian analysis working almost entirely with dreams and symbols! Oh yes! Good one, I can totally relate to that with, Sun, Moon, MC, Venus, Mars and both Liliths all in Aquarius. I think the house is really important too. I feel more like a Saggy with Jupiter rising and that stellium in the 9th. How much do you feel like a 12th houser/Neptunian/Pisces though because that energy is very different from a Leo? Sag and Aqua have lot more in common atleast. that’s quite a stellium too! The odd mix of Leo and Pisces is, thank god highly creative! Politically I’m the kindest fascist I know! I dream for the entire world, paint, write, make clothes, had a theatre company, get radically immersed in music ( I played piano by ear from the age of four, I am convinced this was left over from a previous life) , love meditation, taught yoga for years and practiced from the age of 16 way before it was fashionable, but then sometimes feel overwhelmed by the desire to create things, have difficulty putting the vision into reality and in answer to your Q how does it feel… Well BONKERS at times! I fall in love too deeply and take years to recover when it goes wrong… The funny thing is, an astrologer told me way back when I was about 20 that with all that Leo my life would manifest as very Aquarian and he was right! Both signs are fiercely independent of course. The weirdest thing about a full 12 th house is that people project on to me like mad and some of the stuff whichnhas been ascribed to me is, frankly hysterical! Of course at times I look in the mirror and think, who is that person. Ultimately I am happiest when I am in meditation… Pisces… But then there is always the allure of the beauty parlour! Funny about the opposite thing because before I discovered the fixed stars, I always felt I should be a Leo. I love all things camp and regal. My house is so Leo, giant chandeliers, big gold mirrors, red velvet curtains, 4 poster bed, ornate fireplaces, sparkly granite worktops..oh god it is bad, but I don’t have gold fish shaped taps in my bathroom (though my parents did..eek) and I’d wear a crown out shopping if i could, but id get beaten up.. I could go on. My best friend at college was a loud gay Leo man with a golden mane of spiral curls who loved to dress up as Madonna. And now I’m with a man with Mars on Regulus, couldn’t be happier! Everyone should try and be a bit Leo now and again just for fun! Actually, I think they do when they take their holidays in August. They get to drop their uniforms, parade on the beach, be generally sybaritic and make likeable idiots of themselves as they claim a bit of beach as their kingdom for two weeks! I certainly lived up to my Aquarian opposite by being a single working mother from the age of 18, back in 74 when it was a very new idea, traveling all over the world to places off the beaten track, having a very unconventional household and being generally radical. My radical writings as a sixteen herald got me thrown out of a convent! I shied away from gold taps but love lavish curtains! I still expect to rule the world one day… The marriage of Leo and Aquarius! That should say Angela Davies (Davis?) birthday today! Another iPad typo! It should say a sixteen year old but came out as a sixteen herald! Heraldry!!! Love them freudian typos. There is a theory somewhere that there aren’t really 12 signs, but 6 polarities. You know I think I agree with that. But maybe they are only pronounced with stelliumites. Jamie is a Virgo, but he can be a bit of a zoned out Pisces a lot of the time….I also remember a Taurean stellium guy who was such a suspicious and secretive Scorpio with a right old sting in his tongue. Rgds the stellium thing, Jung calls it an enantiodromia – when something turns into the opposite of what it is! Perhaps each sign has its shadow in its opposite? i.e the negative aspects of the opposite sign? I’m going to keep a good look now! As a Virgo asc I am either anally tidy or in a state of Piscean flux! i.e chaos! The more I think about it the more it works. It also means that the signs then work for both hemispheres! Its like ying and yang isnt it? Each sign has a part of itself in the other. I have less of an aversion to using the signs if i think of them in this way. I know some very indecisive Aries who need advice of all an sundry before they make a decision. And I know some really selfish Librans!! So really, the opposition shouldn’t be such a bad aspect either. I have always suspected this. I guess this is why Ophuichius was left out then. Billy no mates. I think we’re really on to something here Marina! Your yin yang analogy is spot on and I agree that certainly, the natal opposition is no so bad, it can offer a balance between two signs. I’m now going to scour the heavens for a possible opposite to Ophiucus! I also know some indescribably selfish Librans who are real trouble makers and some very diplomatic Arians! The balancing of the yin/yang and polarities can actually be found within Ophiuchus, if we apply broader interpretations to it than the usual greco-roman patriarchal meanings. Our mate, personally and cosmically, isn’t “out there” somewhere. It lies right at the core of the thing itself. Ditto Sistertongue (love it) I can vouch for that. Do you think that if we could get over ourselves that we might just channel down from above. A pure stream running through us. But we’re seemingly no where near there are we, are we? I don’t know where that fits with all the other intents. The merging with the cosmos etc. Opposite because he is all in one. If Algol is the Lilith star than ophuichius is the Lilith constellation.Describes the casting out of paradise (The ecliptic),being exiled and then ultimately finding her “Adam” inside her and claiming her own sovereignty. Ophuichuis worships nature like Lilith. Neither bow down to The solar God. You might find this very enlightening rgds archetypes of the feminine. What do you actually base this on? Yin/yang doesn’t imply or mean mate. It is just polarity of qualities. Taking the idea that everything contains the seed of its polar opposite – as seen in the yin/yang symbol how do we find that in Ophiucus? Are there myths from other cultures which might explain your idea that Ophiucus contains the balancing? The Yin yang symbol is similar to the Hunab Ku – which seems to represent two spiralling forces in opposing directions which from the Shamanic point of view at least cold be seen to cancel gravity or provide a vanishing point of some kind. Can you explain how the balancing yin yang polarities are represented in Ophiucus, I would be very interested to know as mythoology on the constellation is not that abundant. Don’t dismiss Graeco Roman mythology as patriarchal until you have studied the ancient mytholgy and how it arrived – that is to say, the significance of the planet Saturn in ancient skies as it wan’t just an idea based on preference, it was a mythology based, as they all are, on a physical reality. This is a brilliant starting place youtube.com/watch?v=qzxVhLcCH8w and will explain much of what you need to know about the planets and mythology. Please note that to the ancients Libra actually represented the claws of Scorpio, and did not exist unto itself. Ophiuchus on the other hand was construed as medical. Genetics play a large role here, and the key lies with Chiron. Try it and see.